Teaching your horse to stand still. Horses which are constantly moving about are usually anxious about their situation, in control of the owner and confused about their role in the horse-human relationship. This DVD also covers the “Pull & Release Technique. 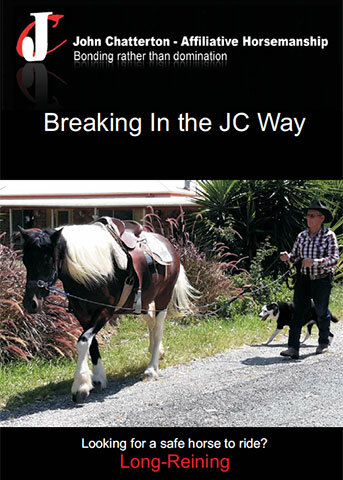 John discovered early in his training that if your horse doesn’t know how to “Stand Still” it can lead to multible problems in all aspects of their handling. The common way to teach your horses to stand is through tying up short or cross tying, holding tight onto the lead or hobbling, these methods don’t actually teach a horse to “Stand Still” and relax. There is very little you can get done such as teaching them to pick up their feet politely, saddling, introducing new objects, washing and clipping. John believes that 80% of training is ‘Standing Still’. When your horse has learnt to stand still you can easily wash, brush, clip, pick up feet, rug and saddle up, this is also a must when mounting your horse. This Step is valuable for teaching your horse to stand politely in the show ring, especially teaching them that it it safe to stand still when frightened. This step will be your most valuable tool! Some horses fidget when being handled or touched as they relate to your hand as being the pressure, this comes from being held too tight or often they view your hand as a punishment when it’s physically used to slap them as a correction. 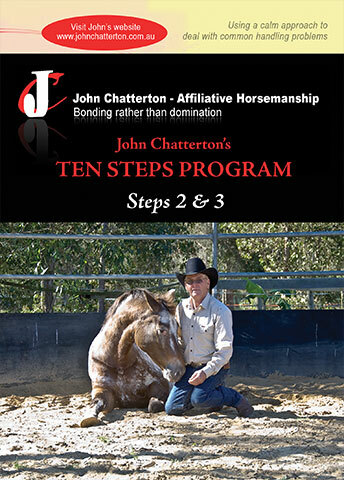 John introduces himself to every horse by gently placing his hand across their muzzle. This spot in particular is very sensitive to the horse so they usually pull away. This is where John quietly persists to prove to the horse his “hand” is always something nice to the horse. 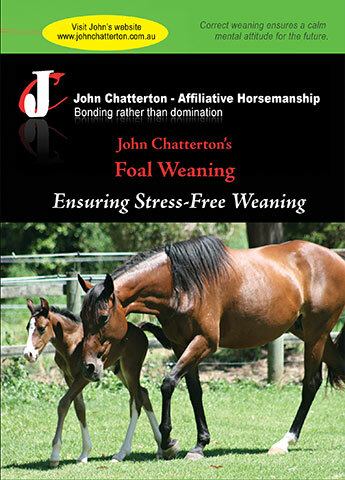 Most importantly John is not as concerned with the “Touching” as he is in achieving the “Relaxing”, if your horse is not truly relaxed they won’t be accepting you! John always looks for the 1% try. You will often hear this term from John…”Always look for that 1%” never go for 100% at the start! This Step is valuable if you need any veterinary attention especially when handling around the head. What is the Pull & Release? The Pull & Release is the ‘correction’ that John uses. This is a totally different concept on how to correct a horse when he makes a mistake. Most training corrections are applied by the handler using body language going toward the horse and using body movements to correct him. Some examples are, swinging the rope to drive the horse out of their space, using a whip to discipline them, using their hand to hit the horse and running the horse backwards. 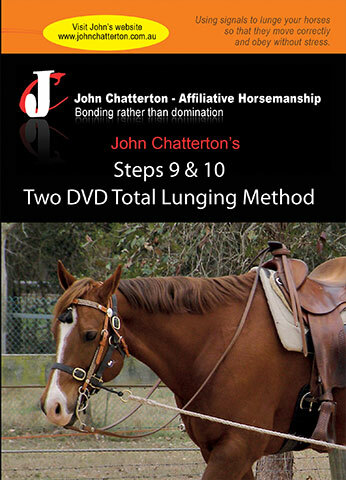 The difference with John’s Pull & Release is that he steps “away” from the horse when applying a “smooth pull & a quick release”. The horse never feels intimidated because you are stepping “away” from the horse rather than towards him to chastise him for making a mistake. 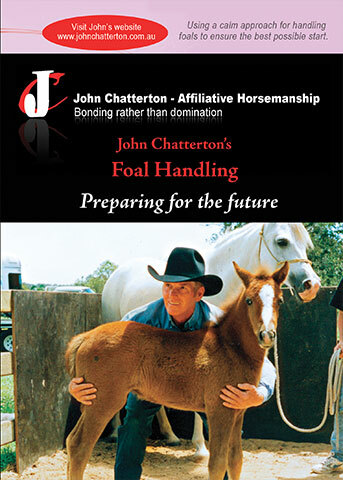 John’s horses always look to him as their “comfort zone” as he never moves towards them to correct them. In the horses eyes, when you go towards them to correct them, they see you as an intimidation and feel they need to challenge you to become higher in the pecking order.